The street art I’ve witnessed, in Berlin, Belfast, Sydney, tends towards definite styles, photo realism, cartoon characterisations, or sophisticated name tags, but your work appears to be quite a break from those approaches. 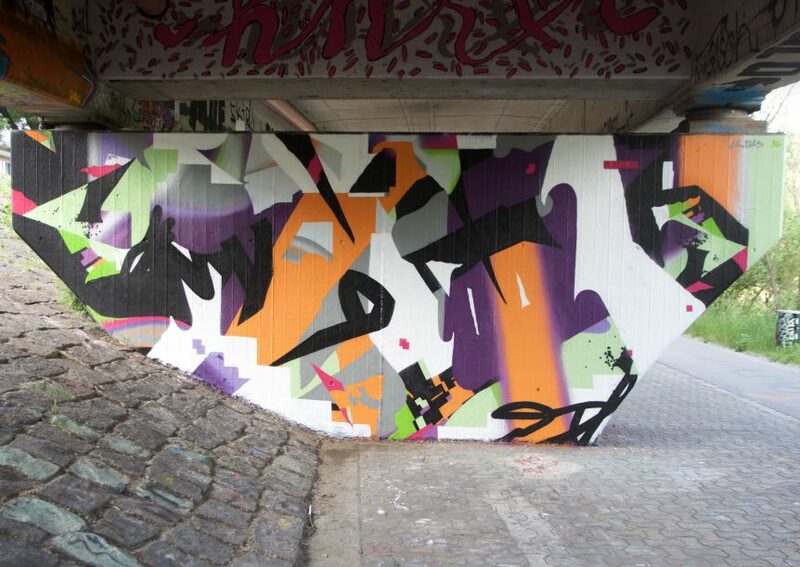 Where do you see your work with regards prevailing Street Art orientations? I’ve pretty much painted in every style over the last couple of years, but I think what I do now is a result of being influenced by many different fields, contemporary art, design, architecture. When I was younger I thought that a good painting was something that needed a literal interpretation, but now I find the thinking behind the work more interesting. Good visual art needs a balance between the conceptual and aesthetic considerations, and both should follow a progression. As a result I moved to abstract work because it can express ideas more thoroughly. With literal painting there’s a safety net of interpretation. For example, if you paint a portrait in an abstract style it will always be perceived first as a portrait, any other ideas in the process will become secondary. With the paintings I do at the moment I want to elevate the idea to the primary level which results in the work being abstract. I don’t consider any genres of street art or anything like that, I just follow my interests. What comes first, the wall or the work? I’ve wondered whether you take work already completed and then apply that to the wall, shop front, house etc, or whether the surroundings – where the wall is situated for example – influence the creation of the artwork? Most of the time when I’m painting a wall I design it on the computer first. I need to have a pretty good idea of what I’m doing. Normally you only have a short amount of time so you have to be organised, knowing what you’re going to paint, and have the right colours. It contrasts hugely to how I work in the studio where I have weeks or months to complete a work or just disregard it altogether. But yes, the spot definitely influences the piece. Normally the ratio of the wall is ridiculous (long and short) completely different to a nicely proportioned canvas. It’s more difficult to compose a pieces with such proportions. Also the immediate area can affect the colours, for Hit the North I had originally designed a piece mainly with reds and oranges, but do to the many red brick buildings around the piece I decided to change the colours to help the painting contrast with the surroundings. In your presentation at the Hit the North Festival you spent quite a bit of time explaining the creative process you utilize. Why did you feel that was necessary? The process is more interesting in my opinion, also I think it can help people understand the approach and how the work was formed. I think it’s more beneficial to show the process as opposed to only the finished works. How many walls would you work on in a year? A couple years ago I painted walls frequently, but now I find the time in the studio to be more productive. Now I only paint walls if it’s a nice spot and I think I could do something decent on it. This year I’ve only painted a couple maybe 5/6. To be honest I think I’ll paint even less next year, I can see myself transitioning to the studio full time. Do you ever work in local communities, in estates for example, or is most of what you do in city centres? 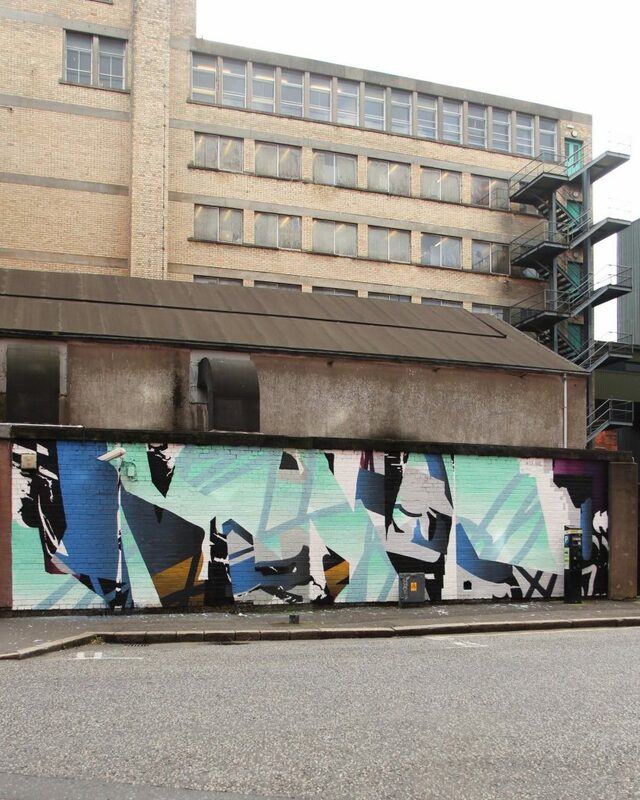 About ninety percent of the walls I paint are in the city centre and occasionally in abandoned factories where you can get away painting undisturbed. It really just depends on where you can get away with it. Do you do any work with young people, passing on skills, encouraging others to get involved in Street Art? I did a workshop with a group of transition year students once. It was complete mayhem and I wasn’t invited back. But I think encouraging young people to have an interest in art is a good thing. From personal experience, I think young people with an interest in art are in a minority. I think that street art is more accessible and appealing to young people especially when considered against galleries and the fine art world. Hit the North festival was great! It was really well organised and there was a great gang painting at it. Hats off to the organisers, Community Arts Partnership, Seedhead Arts and especially to Ali, Adam and Julianne. I think when you have a festival like Hit the North it allows artists to paint more considerate work and have proper support in terms of paint and equipment. By having quality work I think it build positive connotations with street art and can really lift an area.